…So, on that note, we’ve only gone and got TONY frigging LAW to come and headline. This multi-award winning comedian is the undisputed King of Surrealism and is hero-worshiped by comedians the world over. 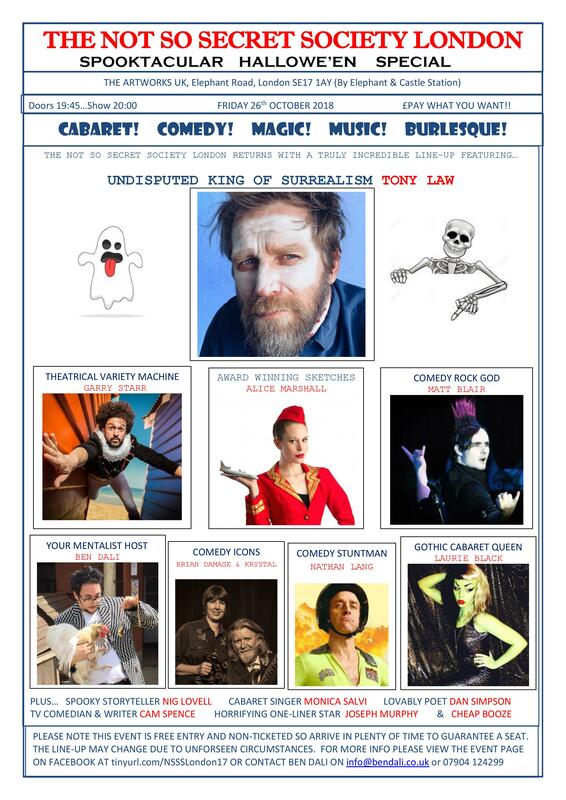 Seeing Tony Law on stage is an unforgettable experience which you will not, umm, forget. We’ve got a typically jam-packed night of mostly Hallowe’en themed stars, including the comedy rock God and half of cult cabaret band Rayguns Look Real Enough MATT BLAIR; the man who nails every genre of theatre GARRY STARR; award winning comedians: sketch star ALICE MARSHALL and TV writer CAM SPENCE; returning faves the queen of gothic cabaret LAURIE BLACK, legendary London circuit act BRIAN DAMAGE & KRYSTAL, and physical comedy Stuntman NATHAN LANG. Plus exciting new horrifying acts in the ghostly forms of spooky storyteller NIG LOVELL and scary one-liner comic JOSEPH MURPHY and scarily talented cabaret singer MONICA SALVI, plus leading poet DAN SIMPSON. And if all that isn’t enough for you, our returning Mentalist host BEN DALI will be delving into your minds to amaze and enthrall with his scary ability to assess thoughts and body language, while serenading you with a Hallowe’en song or two. And of course, what Not So Secret Society would be complete without our DIRT CHEAP BAR. This Hallowe’en special is a part of Artwork’s themed weekend which also features an on-site escape room, Night of the Dead party and family activities. It’s going to be a truly epic night with a wonderful atmosphere that everyone present will count as an entertainment highlight of the year. We hope you can come be a part of it. And in case we didn’t mention…ENTRY is FREE!